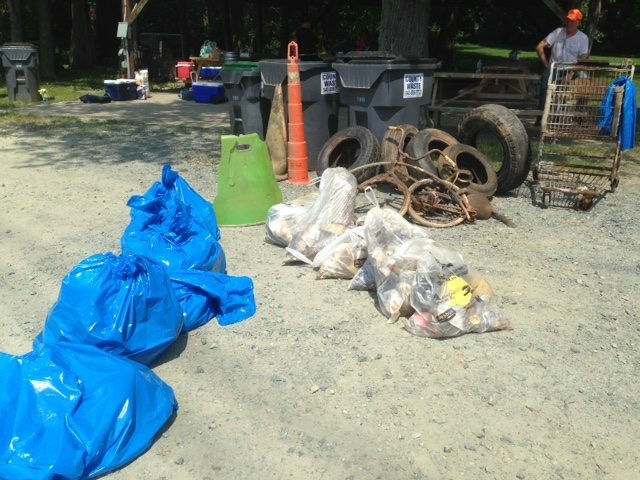 Green Aquia, a group of environmentally conscious neighbors in Aquia Harbour in Stafford County, clean up litter and debris that washes down streams through their community before it reaches the Potomac. Volunteers have been out twice so far in 2015. The April cleanup netted over 1200 lbs of trash, 13 tires, a fire extinguisher, several sports balls, and lawn chairs. They separated 20 garbage bags of recyclable cans and bottles. In all 25 volunteers gave about 3 hours of time cleaning up junk. In addition, one gentleman spent about 8 hours in a canoe floating Austin Run and pulling trash out of the water. The picture is from the July cleanup. It was a smaller event, but still incredibly successful! 8 volunteers collected about 600 lbs of trash and recyclables, as well as a shopping cart, traffic cones, a bicycle and 5 ties from Austin Run.